Every few weeks our steed gets a bath. We run in the dusty Southwest and after a while the swirling tornadoes of dust dull everything on the truck. I'm sure it's also stripping the paint as we drive, just like it carves away rock in the canyons, but there's really nothing we can do about that. In the winter we wash more often, as the road salt does a number on everything. But it needs to be done in the summer, too. Dust, dirt, and bugs. Oh. My. God. The bugs. 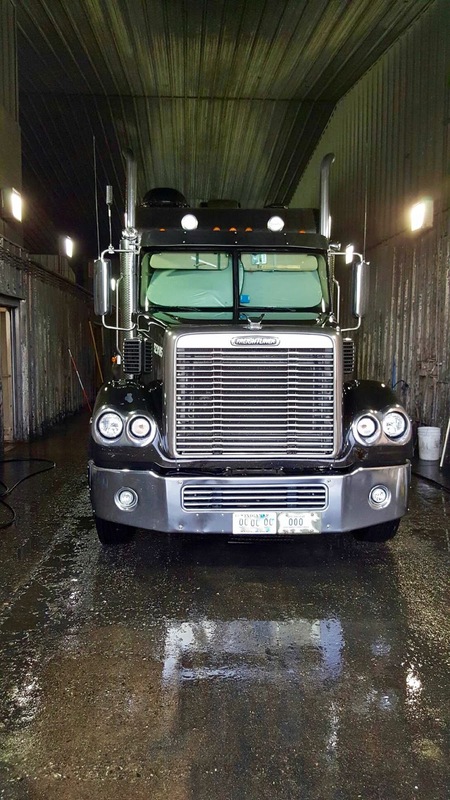 It costs $77 to get the truck and trailer washed, which is about the national average. Some places do a better job than others but when it's done, no matter where it gets washed, it always looks ten times better. Here you see her leaving the wash bay with a smile.